These past few weeks I’ve been too exhausted to cook or even really bake much. I’ve been eating out with my parents, eating over at my parents’ house, eating with my girlfriends, and sometimes throwing something together at home. I’m sure you know the feeling. Work is overwhelming, your personal life is a roller coaster, and standing in the kitchen becomes a chore rather than a joy. No one ever told me that being a beginning grown-up was so hard and tiring! Your college diploma should come with a big warning label: Hard times ahead. Forget staying up late to party or study. You won’t be able to make it past 10:30pm lots of nights. You think being independent will be cool and will involve having fancy drinks at fancy bars, buying awesome clothes, and decorating your first real apartment? Think again and this time include bills, rent, credit cards, food for your pets, gas money, food for yourself…and then swear that the only time you’ll look at your bank account is when you need a good cry. Oh and balancing your personal and work lives? They overlap. Work seeps into personal time, even if you don’t work long hours. It affects your personal relationships. Just…be prepared. OK, so enough with the bitching about being a grown-up. The good part is that if you do come home from work one day and are craving cookies like woah, you can make a batch of cookies if you damn well please. 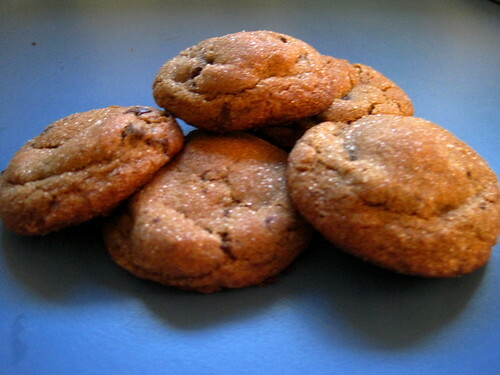 And these ginger chocolate cookies are the ones you should probably make. That’s what I did one Friday about a month ago. (shut up, I know I’m behind on posting!) They’re hella easy and you most likely have everything in your house. (You may not have molasses, but you should probably buy some and keep your cabinet stocked with it always. It adds amazing depth and flavor to baked goods.) Kind of like chocolate chip cookies with a fantastic kick. Position the racks in the middle of the oven. Preheat the oven to 350° F. Line two baking sheets with parchment paper or just spray lightly with cooking spray. Combine the flour, baking soda, spices, and salt in a medium bowl and set aside. In a large bowl, using an electric mixer on medium speed, beat the butter and brown sugar until blended, about 2 minutes. Stop the mixer and scrape the sides of the bowl as needed during mixing. Add the egg and molasses and mix until everything is blended and an even light color, about 1 minute. On low speed, add the flour mixture, mixing just to incorporate it. Fold in the chocolate chips. 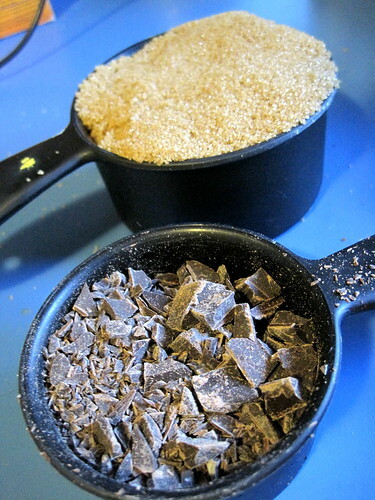 Put the granulated sugar into a small bowl. 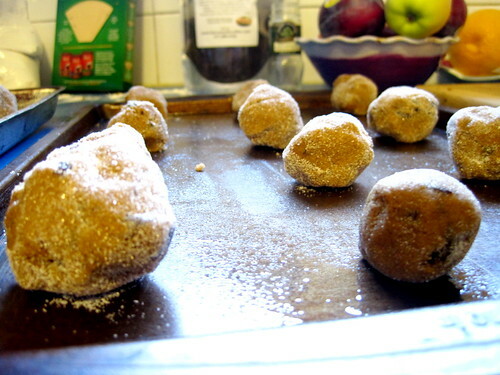 Roll a heaping tablespoon of dough into a ball, roll the ball in sugar to coat and place on the prepared baking sheet. Do this with the rest of the dough, spacing the cookies about 2 inches apart. I usually get 12 cookies on a sheet. Bake the cookies until the tops feel firm but they are still soft in the center and there are several large cracks on top, about 12-14 minutes. Cool the cookies on the baking sheet for 5 minutes, then use a wide metal spatula to transfer the cookies to a wire rack to cool completely. Glad I’m not the only one. And glad I’m inspiring someone! Thanks Heather 🙂 Also, the chicken stew sounds tasty…! And I’m trying ginger in my oatmeal tomorrow. I love oatmeal. chocolate and ginger sounds like a perfect recipe to snuggle up to in cold weather. well done!